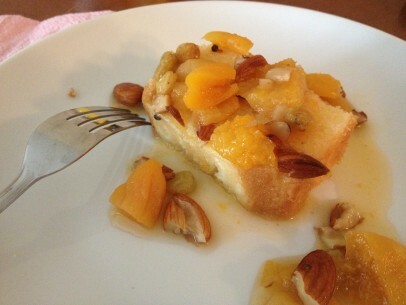 This dish was often made in winter as a way to use dried fruits like apricots and raisins that were harvested in summer and hosafi is still a popular New Year’s treat today for Greeks hailing from Cappadocia. Summer sun in every spoonful! 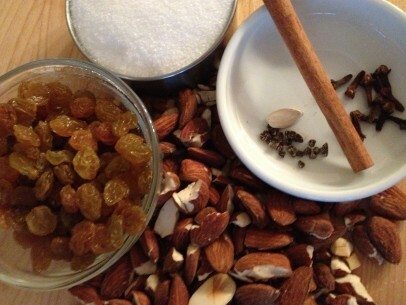 Almonds, sugar and golden raisins round out the simple list of ingredients. I try to set aside about an hour to soak the dried apricots, covered in an inch or so of water, until they plump up. Remember to save the soaking liquid to add to the cooking liquid for extra flavor. 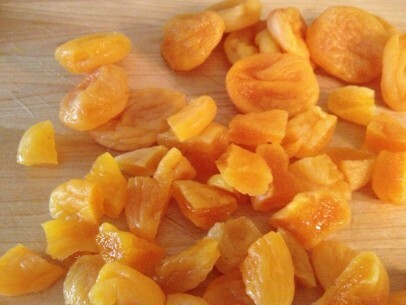 Once they’re rehydrated, chop apricots into bite sized pieces. I like to get 3-4 small pieces from each apricot. Depending on the sweetness of your apricots, you may get a bit sticky and need to rinse your knife in warm water to get through this part. It’s so hard not to snack on these sun shiny sweet morsels! You can add the cinnamon stick directly to the apricots and water but I suggest keeping the cloves in a tea strainer which you can then float in the liquid. A rogue clove in this recipe could break a tooth so keep your cloves confined! 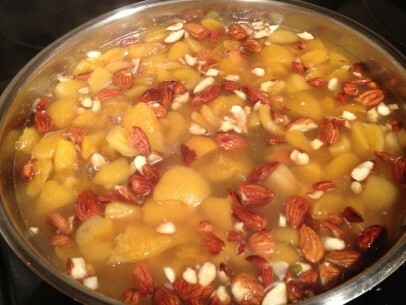 The cardamom seeds can be mixed directly into the apricots and cooking liquid. They add another lovely fantastic layer of citrus flavor to the dish. I prefer to use coarsely chopped, toasted almonds but I have had hosafi with sliced almonds also. If you’re going with sliced almonds I do suggest you toast these as well but be very careful to watch them as they can burn much more quickly than whole or cracked almonds. A 3 qt saucepan works well for this recipe and is actually the smallest size pot/pan I would use here. Arrange shelled almonds in a single layer on a baking sheet and cook at 350 degrees for not more than 10-12 minutes until they take on a nice, golden brown color. You can give the pan a quick shake at about the five minute mark to make sure your almonds toast evenly. 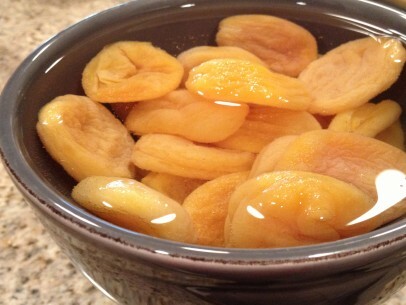 Soak dried apricots for at least an hour until plump. Drain and (IMPORTANT) save the soaking water. Set aside. 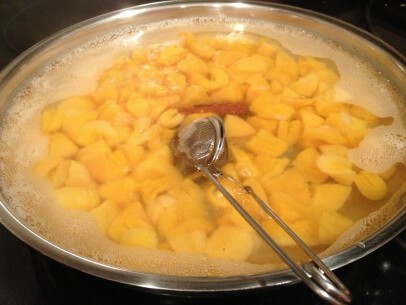 Chop apricots into quarters and add to pan with 3 cups water and soaking liquid. Cook on low heat for 30 minutes. Add spices and sugar and cook on med-low (good simmer) for 35 minutes. Stir every 10 minutes or so. Add nuts and raisins and cook for another 5 minutes. Extract cinnamon stick and cloves. Stir well and remove from heat. Serve warm, room temperature or chilled. One of my favorite ways to enjoy hosafi is to spoon it over a piece of bobota (traditional cornbread) for a special dessert. I’m sure you’ll find many ways to make this dish a favorite of yours too! Love this! It’s become a breakfast staple for my husband who eats it with a little Fage yogurt. This is a go to for me during lenten fasts too! One question. 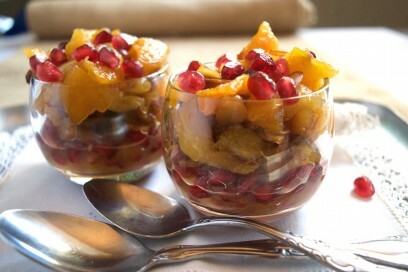 When do you put the pomegranate seeds in, do you cook them down with everything else or when you are serving it up do you add them?